Unsaturated fat comes in two forms: monounsaturated and polyunsaturated. Including these healthy fats as a part of a well-balanced diet can result in a lowering of cholesterol levels and help prevent heart disease, reports the MayoClinic.com. The body needs a moderate amount of fat to function properly, and the main source of fat should come from unsaturated fats. The key to eating fat--even unsaturated--is to consume it in moderation, because eating too much will lead to unhealthy weight gain. Peanut butter, a spread derived from peanuts, contains high amounts of healthy monounsaturated fats. Raw or unprocessed peanut butter has the healthiest nutrients, because it does not contain any additional ingredients. When choosing processed forms of peanut butter, look for spreads that do not contain high amounts of added sugar, which adds unnecessary calories. The majority of vegetable oils on the market are comprised of healthy unsaturated fats, but a few still contain high amounts of saturated fats. Discovery Health reports that oils such as olive, canola, peanut, safflower and sunflower all contain unsaturated fats. Use these oils to replace those that are high in saturated fat when baking, seasoning food or cooking. Unlike most animal proteins, fish is comprised of high amounts of unsaturated fat. The best fish choices include salmon, halibut and albacore tuna. 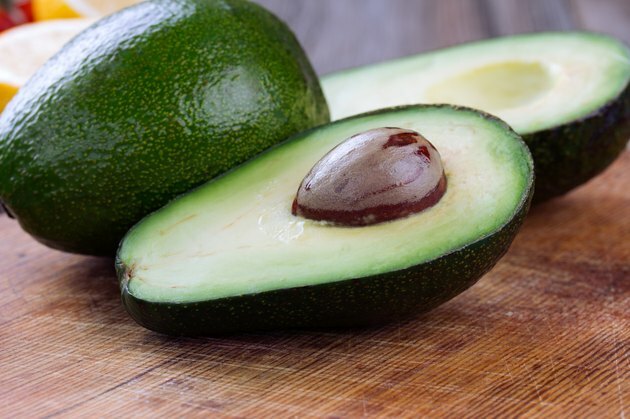 According to the American Heart Association, avocados are comprised mainly of monounsaturated fats.You can mash avocados into guacamole, but they have many other uses in cooking. Slice avocados and eat them alone or added to salads. The MayoClinic.com suggests that using them on sandwiches as a healthy substitute for cheese. Eating raw nuts can provide a rich amount of unsaturated fats. Nuts are a healthy, portable snack with energizing protein content. Also, they help promote healthy weight when consumed regularly and in moderation. Some nuts high in unsaturated fats include almond, pecans, walnuts and pistachios.